This awesome appetizer may look like sushi, but it’s the farthest thing from it. If you can believe it, or if you’ve seen the recipe on TV from Food Network Chef Guy Fieri, these rolls are stuffed with an assortment of your favorite bar food fare. We made a big batch of these for a Super Bowl party and stuffed ourselves sick. They were such an amazing combination of tastes and textures of dishes that we’d never experienced together before. The light chewiness of the rice roll and wrapper was combined with the tangy savory deliciousness of BBQ pork, hot fresh french fries, and fresh avocado. 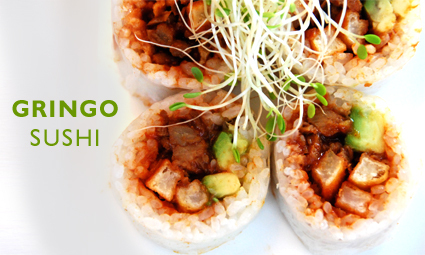 Check out the original Gringo Sushi recipes on Guy’s website and be inspired to roll up your own combination of ingredients! Besides the amazing taste, the real fun of serving this dish is all in the presentation. It’s fine dining meets pub food. These bite-sized treats have all of the visual appeal and finesse you get from a traditional sushi dish with all the comfort and down-home tastes of a BBQ and burger joint. To make the rolls, prepare your filling ingredients ahead of time. Choose any combination of foods that sound good to you. For this version, we got our filling ready first. The fries were cooked, the pork was sauced up and simmered for a few hours, and the avocado was thinly sliced. The rest of the process was just like making traditional sushi. We cooked shushi rice according to package instructions, pulled out our bamboo rolling mat, and began to layer ingredients over a softened rice wrapper laid out flat. 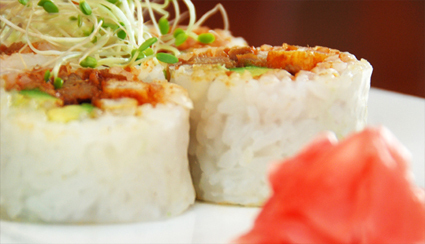 After rolling things up, we sliced our Gringo Sushi into 1-2″ portions and set them face-up on a platter for serving. Chipotle mayonnaise and a bit of wasabe make great condiments.